Park City&apos;s two resorts have so much terrain to cover, you won&apos;t get close to exploring it all in seven days. Park City is unique among winter vacation destinations because of the diversity that is created by having two world-class ski operations within minutes of each other. 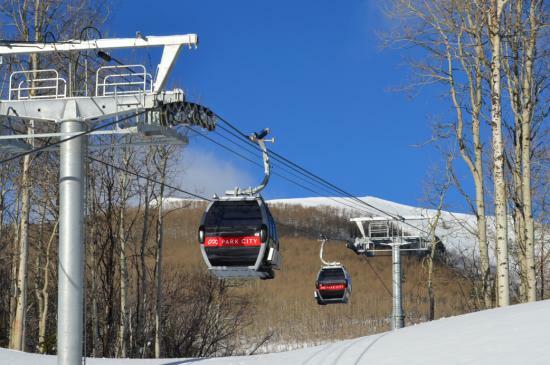 In some cases, Deer Valley Resort is separated by a rope on a ridge from Park City Mountain Resort, but there is no connection beyond that, so you’ll rely on the character, access, and infrastructure of the town to open the gates to both. You could easily spend 7 days at only one, but for this itinerary, buckle up for a whirlwind tour of both. The High West Distillery & Saloon. Arrive at Salt Lake International Airport before noon, and it’s conceivable you could head straight to Park City and be on the mountain for a half-day of skiing/riding. Plenty of seasoned Park City visitors do it. But for this trip, you will be taking the long view, and there will be plenty of turns to come over the next week. Whether you are renting a car or taking one of the many shuttle services that will deliver you and your party from curb to condo, take your time making your way to where you’ll be spending our nights. You have plenty of choices, but a great one is Silver Star, which offers condo-style accommodations at Park City Mountain Resort. One of the nice things about Park City is that no matter where you stay, it’s an easy trip to hit either resort or the downtown area. After you get dialed into your digs, why not head to Main Street and start with some cocktails at High West Distillery & Saloon? If you like what you see on the menu (you likely will), either stay put for an early dinner, or take your pick of dozens of critically acclaimed eateries along Main and Lower Main Street to suit the mood. 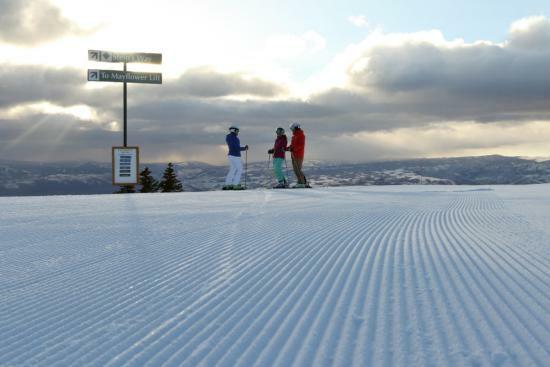 Start the day with some groomed trails at Deer Valley Resort. There is a lot of skiing to cover on this trip, and we’ll start with Deer Valley Resort. Start your day from Snow Park and you will be "Steining" hard, that is to say cruising some of Deer Valley’s legendary well-manicured mix of steeps and cruisers off of Bald Mountain. Take a few trips down Stein’s Way and the mixed terrain off of the Sultan chair. With amazing views of the Jordanelle Reservoir far below, you’ll find no shortage of selfie spots. Lunch will be at the Silver Lake Lodge where the options will confound you, like Bald Mountain Pho. Seriously, where else can you get Pho on a ski hill? Dinner will be a reservation (highly recommended) for you and your group at Fireside Dining, a four-course, fixed-price experience that is more than just a meal. High up on the mountain at Empire Lodge, you’ll enjoy favorites from the European Alps like Swiss raclette, stews and roasted meats, and dessert fondue cooked right at the stone fireplaces at the lodge. Stop at the legendary Stein Eriksen Lodge for lunch or dinner. The next day will be more of the same at Deer Valley, with an emphasis on exploring the terrain on the Empire Canyon and Lady Morgan side of the resort. You may or may not notice that while doing laps in Empire Bowl, you are literally just one rope away from Park City Mountain’s McConkey’s side, but hold those thoughts for a few more days and focus on Deer Valley. If you are looking for steeps, try Daly Chutes. If there is a powder day in the forecast, you could spend half a day just lapping the trees off of the Lady Morgan chair. On powder days at Deer Valley it just seems like it doesn’t get tracked out quite as fast as other mountains. Use this wisdom to your advantage. 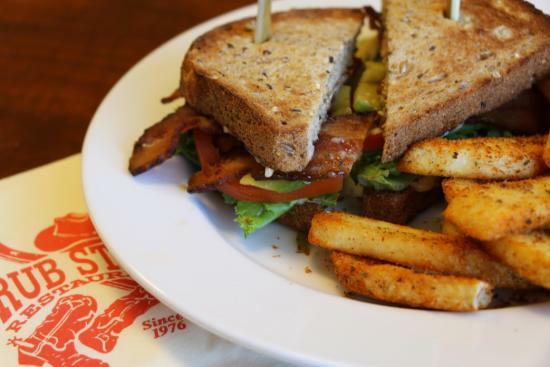 For lunch, unbuckle your boots and sit down to a table at the legendary Stein Eriksen Lodge, just steps from the Silver Lake area. Resist the temptation to have a lunch blend into the apres hours. Get out there for some late afternoon runs, all the way until closing bell. Dinner tonight will be a little more casual and ad hoc, you’ll head out on the town and see what feels right—maybe Southwestern at Chimayo, or locals’ favorite sushi rolls at Flying Sumo located on Lower Main in the Town Lift building. Pack up your gear and check out in the morning and shift focus to another part of town. Get the best steaks, seafood, and chops in town - as well as burgers and sandwiches - at the Grub Steak Restaurant. After two solid days at Deer Valley, it’s time for a mid-week transition, but let’s not call it a rest day. It’s time to channel your inner Norwegian and sample some of the town’s other kind of groomed trails and get some cardio in. Check out the White Pine Touring Nordic Center, steps away from Silver Star. In the non-winter months, this is the home of Park City’s municipal golf course, but in the winter it’s transformed into the town’s cross-country skiing hub featuring a variety of groomed track for both skate and classic cross-country skiing. All your gear needs can be handled right on site, and you’ll start off with a lesson from one of the many Nordic-certified instructors who will teach you things in an hour or two that would have taken a lifetime of trial and error to learn. When you’ve had enough, head back to your digs at Silver Star, because, you know, hot tubs. Dinner is at the iconic Grub Steak Restaurant in Prospector Square for a dose of old Park City. Enjoy the best in town for steaks, seafood, chops, and an epic salad bar. Park City Mountain Resort is serviced by 41 lifts, enabling you to explore far from where you&apos;re staying. There is nothing old about Park City Mountain Resort after Vail Resorts took it over and promptly pumped more than $50 million into capital improvements. The most noticeable of these is the Quicksilver 8 person gondola that connects the Park City side with the Canyons side, and the new Miner’s Camp day lodge and restaurant. From where these two are located, you could take the bait and hop on the gondola, but you could also spread yourself really thin riding lifts back and forth, so take a patient approach and ski the Park City side. There are plenty of great runs off of the Silverlode and King Con lifts. High atop the ridge above McConkey’s bowl will likely be the iconic selfie spot on this day. If you are enjoying yourself on this side of the mountain, the historic Mid Mountain Lodge is a great place for lunch. After lunch you’ll be in the right place to make your way to the Jupiter lift, where the most challenging terrain on the mountain sits hidden from plain view. Ski down at the end of the day all the way to where your day began at Silver Star Village, for après at the Silver Star Café. Dinner will be at Red Rock in Kimball Junction. A favorite of the locals, this brew pub features excellent drafts, seasonally bottled varieties, and great pub food. 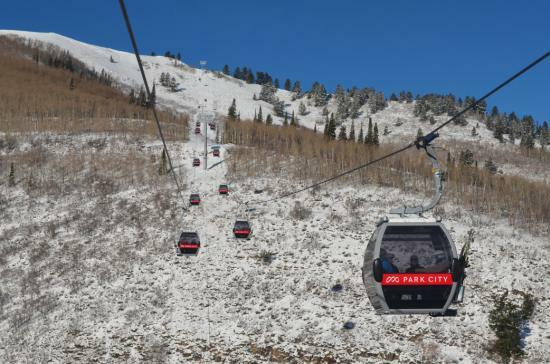 The Quicksilver Gondola transports skiers back and forth from the Park City side of the mountain to the Canyons Village Side. This is your day to focus on the Canyons side. 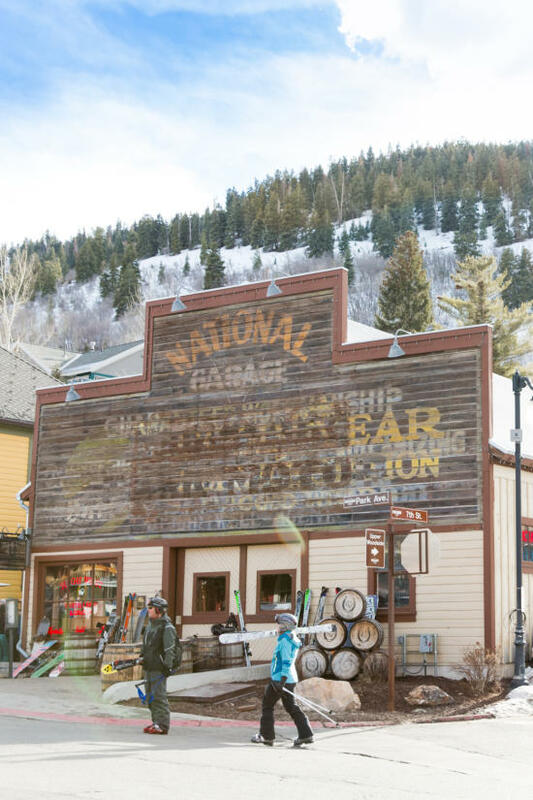 You could get there in two different ways: either from the Park City side, by beelining it up to the Quicksilver Gondola, or consider lining up a shuttle (or the free public bus) in the morning to drop you off at the Canyons Village to start from there. Let’s assume you do that. You’ll ride the Orange Bubble, named for it’s orange-tinted "hoods" that can be pulled down to shield passengers from the weather. Oh, and it’s heated. The bubble gets you to the core terrain on the Condor side, which is where you will find the goods on a powder day. As you work your way back towards the Park City side, and the recently completely renovated Red Pine Lodge will be your spot for lunch. Make sure you leave some time at the end of the day to navigate to the Quicksilver Gondola, so you can make it back to the Park City side for the last run down to the King Con lift, then back to Silver Star. Tonight’s dinner will be back in Canyons Village at The Farm, where fine dining is fused with a farm-to-table menu. 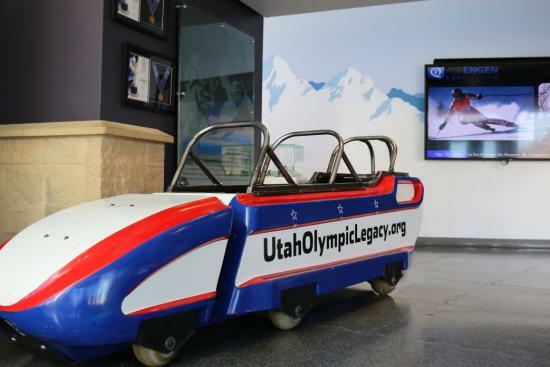 See future generations of ski jumpers and bobsledders train and explore the state&apos;s Olympic legacy at the Utah Olympic Park. Had enough? Not likely. There is no way to do it all in Park City on one trip, and this is all just a scouting mission for your next trip here. If you are the type that burns the candle all the way down and you have a later flight out, you can get another half day at either side of Park City Mountain. If an earlier flight keeps you off your skis for the last day, then check out the Utah Olympic Park on your way out of town. Park City hosted many venues for the 2002 Winter Games, and the Olympic Park is still an active training and competition venue for our next generation of Olympic ski jumpers, freestyle skiers, bobsledders, luge, and skeleton athletes. the Alf Engen Ski Museum is located here and definitely worth a stop. One caveat about this ideal trip: If there are snowboarders in your group, Deer Valley politely remains a skiers-only mountain. 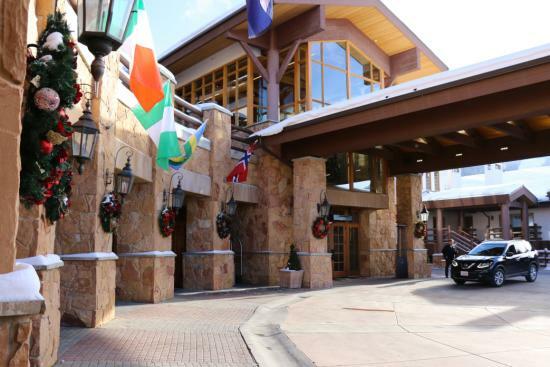 If you want to stay together, you’ll have to do it at Park City Mountain Resort. Or split up when they want to hit the terrain parks. Of course, the great thing about Park City is how many different options are available. Plan out some of your favorites ahead of time, but you really can’t go wrong spending time at either resort.